THE TIARAS ARE BACK! Okay, just one tiara so far, but we'll get there. Of course this as typical a Queen Sonja state banquet look as one can get, with an old dress in her favorite shape and one of her trusty tiara options, Queen Maud's Pearl and Diamond Tiara in the largest of its two settings. But it's a gorgeous look anyway, and really highlights the simple dark blue sash of the Order of the White Rose of Finland. 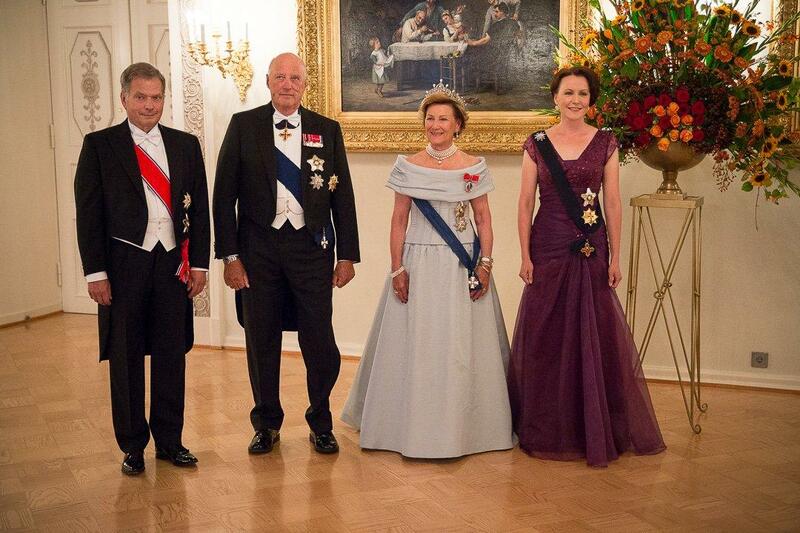 The traditional state visit sash swap is on full display here, with Harald sporting the same Finnish order and Norwegian orders for the Finnish couple (the Order of St. Olav for the President and the Royal Norwegian Order of Merit for the First Lady, who is coming right for me with that gorgeous shade of purple). As though the promise of a tiara wasn't enough, before leaving Norway, the royal family hit another of my weak spots. It's a bunad festival! (Technically, a garden party at the palace which the royal ladies kindly turned into a bunad festival.) Oh, how I love their traditional dress. This is my favorite Mette-Marit outfit of late, by the way; she did have a good turn in a pretty floral, but another repeat in Venice proved the necessity of a floral crown. We shall not linger on that, for we do not need that kind of stress in our lives. Remember the tiara.